If you have ever wondered about how to train the traps then look no further. This article is 100% about training the traps. Bonus material includes a beginning to advanced program. The traps - or Trapezius, is the flat triangular muscle that extends out and down from the neck and down the center of the back between the shoulder blades - looking at a back double biceps pose, it&apos;s the centerpiece of the upper back/shoulder area. In the most muscular poses, it&apos;s what most bodybuilding fans want to see: the higher it jumps up along the sides of your neck the better! 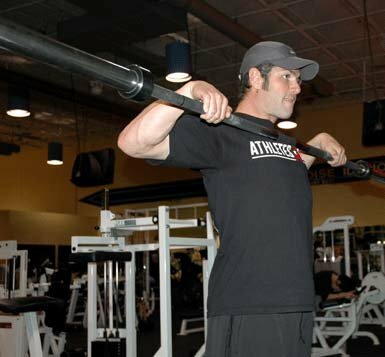 It&apos;s almost always trained with the shoulders (or, deltoids) but can be trained with back and really is, functionally speaking, part of the back. Like calves, there are only a limited number of exercises that work the traps but also like calves, great traps make the bodybuilder. What&apos;s a back pose or most muscular pose with weak traps? On the other hand, how impressive those poses can be when the bodybuilder has great traps! The following movements will stress the traps, although not as much as the two direct exercises listed above. Deadlifts - one of the two (the other being the Squat) best exercises you can do. These can be done with a barbell, dumbbell, various bench press machines, or a Smith machine. They can be done in front of the body or behind the body (Lee Haney popularized this approach). To perform the standard barbell shrug, stand with a barbell hanging at arms length in front of you, using an overhand grip. Raise your shoulders as high as you can, like a "shrugging" motion, trying to touch your ears. Hold for a moment, flex the traps hard, lower slowly and repeat. This is an exercise you can really go heavy on, so don&apos;t be afraid to pile on some plates. It used to be common to roll your shoulders back as you did these, but it really doesn&apos;t add anything to the effectiveness of the movement. "The traps are behind you and that&apos;s where the bar should be." Doing it his way hits them differently and the execution is a little different, as you try to lift the bar up, not just raise it with your shoulders. Of course, the bar barely moves but what an effective exercise! Another variation is one I like. This actually is two exercises in one: a wide grip shrug; with this one you lift the bar like you would an upright row, using a wide (12 in.) overhand grip, while at the same time pulling up with your shoulders as in a normal shrug. When you attempt to lift the bar you won&apos;t get more than 1-2 inches. This is one that hits your front and side delts as well as your traps. This hits the front and side delts as well as the traps. A wide grip makes it hit the delts more. To perform this exercise, stand and hold a barbell at thigh level with an overhand grip - hands about 8 inches apart. Let the bar hang down in front of you. 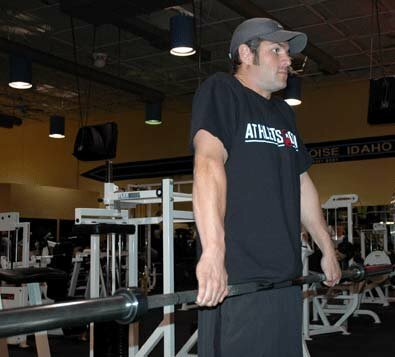 Lift it straight up along your body - close to it, not touching it, until the bar just hits chin height. Lower slowly and repeat. 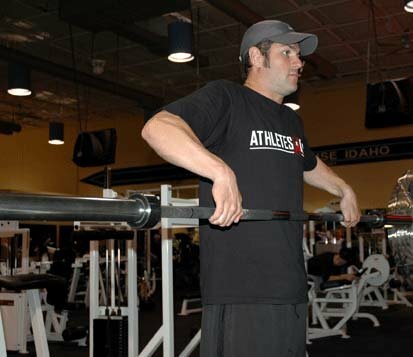 Keep the elbows up; they should be higher than the bar throughout the movement. Of course, you can use dumbbells or the low cable bar instead. 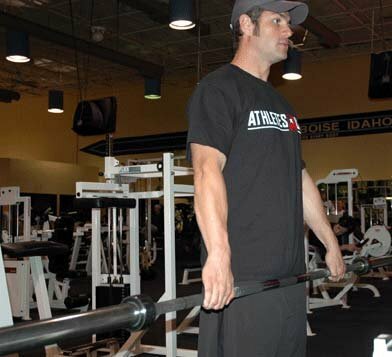 The deadlift is not usually included in trap routines but it does stimulate that muscle. If you do traps on back day, try doing a shrug movement at the top of each rep of the deadlift for a little extra trap stimulation. Meaning You Are Currently Doing No Direct Trap Work. 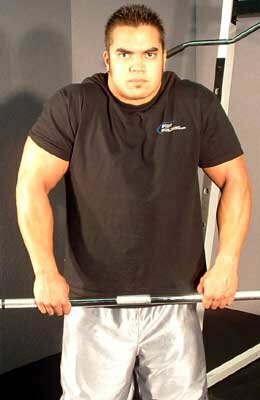 Shrugs (standard) - 2 sets of 8-10 reps - Assuming most beginners are on a full body routine, this is more than enough. If you&apos;ve been training at least 6 months and have seen good gains, you should be ready for intermediate training. Click Here For A Printable Log Of Beginner Trap Routine. As part of a split routine, include trap work with deltoids. Click Here For A Printable Log Of Intermediate Trap Routine. Click Here For A Printable Log Of Advanced Trap Routine. Click Here For A Printable Log Of Weak Traps Routine. If you have really weak traps, add 1 set to the Haney shrugs for 3 sets total and add 1 set to the upright rows for 3 sets total, this makes 8 total sets. Since the traps are usually worked after delts (or back), they should be adequately warmed up so you don&apos;t have to do warm-up sets, you can certainly do one set of 15 reps if you want. Make your first set your heaviest, then decrease the poundage on the 2nd set. You should fail in the rep range listed. While some of you may be tempted to add sets, it&apos;s not necessary, just work the sets hard. If you work them hard enough, you won&apos;t be able to do more. This means lifting heavy weight and it means going to failure. Give these routines a try and see what they do for you.